Tour Plans include traveling to Paris followed by festivals in France and Belgium. Tour dates will be from June 8 to June 25, 2019. •	There is an audition fee of $10. •	A $100 tour deposit is required which will be refundable if tour team placement is not achieved. •	A character dance section and clogging section will be taught and then judged. Audition Dress: Please wear dark clothing and bring clogging shoes as well as gym, dance or character shoes. Ladies should have hair pulled back from face. Evaluation: Five judges will score your performance. Each section will receive a technical AND showmanship score. The audition performances will be filmed for additional evaluations. Dancers who are auditioning will not view the auditions but will be located in a separate area between audition sections. After the dance auditions, a short individual interview will be held with Clog America leadership. This interview is also a very important part of the selection process. The commitment to rehearsal attendance, team rules and standards will be discussed in depth during the interview. 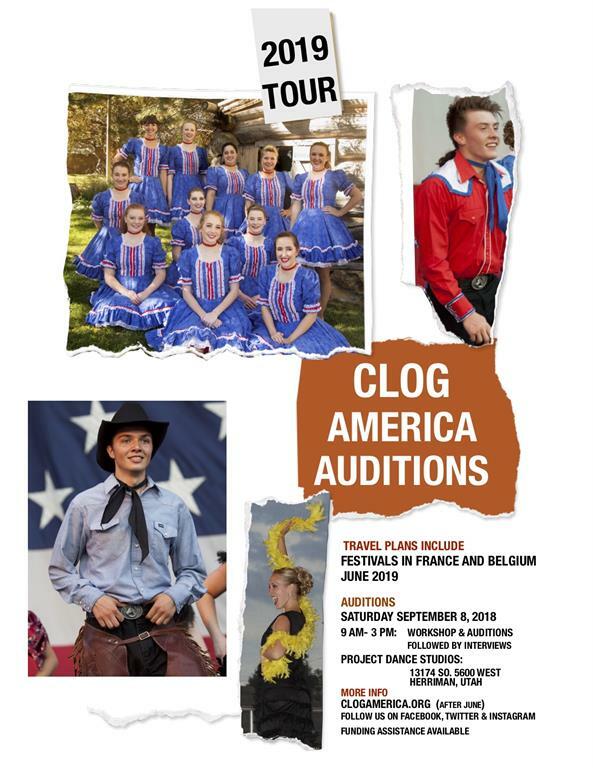 Those auditioning who are currently an active member of a competition team should discuss their Clog America audition plans with their team director before auditions. Your Conditions of Participation: You will be asked to fill out a form on the back of your audition number to allow you to let us know exactly what conditions you have regarding the 2019 Tour year’s rehearsals and performances. There are also team rules, standards and a social media protocol that must be signed. Funding: The tour will cost approximately $2000 per person. There will be partial scholarships performers can apply for plus we will give you tools to use in fund raising efforts including a special individual sponsorship proposals, letters for a letter-writing campaign and corporate matching fund possibilities. We will need to know how much funding help you will need. Personal Conditions: If your participation is linked to others, we need to know your feelings. Rehearsals and performances: Rehearsals are held once each month usually between 9 am and 5:00 pm at the Project Dance Studio located at 13174 So. 5600 West in Herriman orthe Starzz Unlimited Dance Studio located at 3390 W 1987 S. in Salt Lake City. Since rehearsals are only held once each month, attendance is mandatory. The tentative rehearsal schedule will be as follows: Oct. 13, Nov. 17, Dec. 15, Jan. 12, Feb. 9, Mar. 16, April 27, May 18 and June 1. Team members must commit to perform at the Freedom Festival in Orem on July 3. A pre-tour show will also be scheduled before departure on tour.... possibly June 3. Costumes: Costumes are provided. Guys provide their own black jeans (which will be specified), cowboy boots, white clogging shoes and converse shoes if doing Rock and Roll. Girls provide their own white clogging shoes (scoops), black character shoes, white tennis shoes if doing Rock and Roll, flesh colored leotards, dress shields, black pants (which will be specified) tights, wiggie and make-up.